One of my favourite things to make is shaker tags. Making them is a breeze with our Tag Builder Blueprints 6 Die-namics. 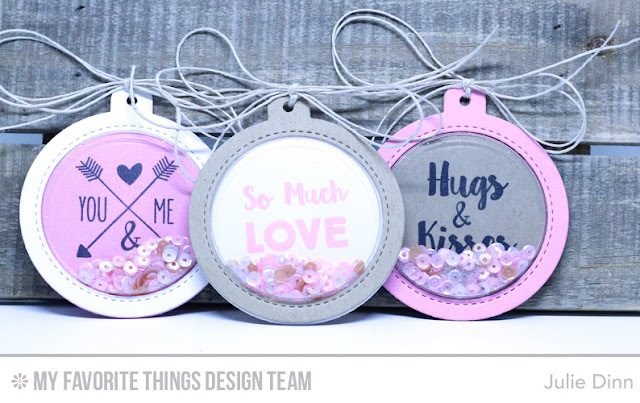 To create this trio I paired a few stamped sentiments from the So Much Love stamp set, with pieces die-cut with the Tag Builder Blueprints 6 Die-namics. For card stock I used Cotton Candy, Kraft, and Smooth White. I finished off the tags with a Hemp Cord bow. Julie--I just love tags! These are great! So cool for anytime, but Valentine's especially!